In a little town of Huelva province lives the young Rocio Vazquez Romero (Maria José Alfonso) who holds a six-month strict mourning for death her grandmother . After that , he meets her boyfriend Rafael Castroviejo (Alfredo Landa). Then , they go walking to the field and go to the cinema to see a Peplum film . Soon after , they are going to dance at the town ball . Alfredo engages marriage to Rocio , but then , Rocio's grandfather dies and Rocio once again has to bear a stiff mourning . Black comedy with plenty of humor , light drama , social habits and a lot of songs . Good film that was beset by difficulties with the censors caused by a relentless critical to Catholic religion , sour rural conventionality and extreme religious practices . This is not the typical comedy by that time , here there is a brief social denounce about the repression and excessive religion during Franco dictatorship . As all the villagers are repressed characters , coerced by social conventionalism , gossip and hypocrisy . In the flick there is especially comedy , humor , satire and social critical which tended not to be very well received by the censor . This is the following to Summers's first film : ¨Del Rosa Al Amarillo¨ (63) that was formed by two episodes about love stories between teenagers and elderly people . But a third episode dealt with a young romance , but it was adapted on another movie , this ¨La Niña De Luto¨ that pays tribute to previous picture . In fact , the grandfathers roles are incarnated by the same actors who played in ¨Del Rosa Al Amarillo¨ , but while the grandfather Jose Cerrudo gives a brief acting , the grandmother Lina Onesti only appears on a photo . It belongs to a Spanish period ¨New Spanish cinema¨ of the 60s directed by students of the ¨Official Academy of Cine¨ or Escuela Oficial De Cinematografia . 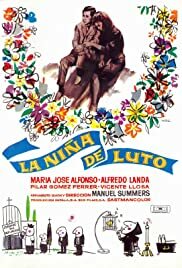 ¨La Niña De Luto¨ or "The Girl in Mourning" has an interesting as well as amusing script by Tico Medina , Manuel-Francisco Summers and Pilar Miro , subsequently to be become a famous filmmaker . This film packs a colorful and evocative cinematography by Francisco Fraile . And atmospheric musical score full of ordinary sounds of the sixties by Antonio Pérez Olea . Adding Andalucian , Folkoric music , popular songs and modern music as twists . And , of course , the famous Bolero , and film leitmotif : ¨Están Clavadas Dos Cruces En El Monte Del Olvido...¨ The motion picture was well directed by Manuel Summers .